Seller: Old Time Classics Inc.
... new shocks, new front end parts. The frame is excellent. 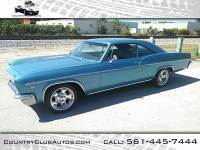 This 1966 Impala SS runs and performs great and sounds even better. ...GET IT SHIPPED Free Auto Shipping Quote: 1966 Chevrolet Impala SS convertible has 327 v-8 automatic trans. Call for more information.